It’s 1993. News of the North establishing reactor plants capable of manufacturing nuclear weaponry have worried the power structures in South Korea, which leads the National Intelligence Agency, spearheaded by Director Choi Hak-seong, to put in place a spy to find out more about the status of these rumoured plants. Enter Park Suk-young, an ex-defensive forces member, who is hand-picked to infiltrate Yongbyon, the town rumoured to have the nuclear plants in the North. Codenamed Black Venus and in order to establish access to the place, Park adopts the guise of a businessman in Beijing, where North Korea has a presence, looking to pool money into the country and gets in touch with Ri Myeong-woon, who heads the Economic Council and State Security Chief Jong, who are both tasked by Kim Jong-il himself to bring in business and foreign revenue for North Korea. In hopes of establishing frequent visits to the hermit country, Park proposes the idea of an advertising campaign for South Korean companies shot in North Korea, which would also have the added benefit of strengthening the relationship between the two countries. After several tests and trials, Park manages to place himself within the North’s trusted circle, reaching up to officials extremely high up the North Korean political chain, even as the Presidential elections in his own country are looming and dirty politics within South Korea make him question his superiors’ motives for the mission. If other Korean spy movies are extreme outdoor sports, “The Spy Gone North” plays out more like a clever game of chess, where any and all actions by the players have repercussions on future events across the board. In that sense, some people might be exasperated by the lack of big set pieces that they’re accustomed to, but action gives way to tense and suspenseful dialogue-heavy scenes. In that sense, it is closer to a John Le Carré novel or film adaptation. The scenes with Kim Jong-il, in particular, are nail-bitingly intense, as are the various tests that the North Koreans put Park through. But it is not to say that the film feels slow by any means. Yoon’s pace is urgent, with the story progressing at brisk-neck speed. Political statements about the two countries’ relationships, the lengths that they are ready to go to for their own benefit and if indeed the two countries wanted reunification in those times, are bold and brave. Yoon’s previous two films “Nameless Gangster: Rules of the Time” and “Kundo: Age of the Rampant” both successfully managed to capture the essence of the times that they were set in, and “The Spy Gone North” is no exception, featuring an accurate depiction of early 90s. Even the CGI-rendered images of North Korea are perfectly realised and seem authentic. Choi Chan-min’s cinematography is beautiful, almost buff-tinted at times, adequately capturing supposed North Korea, South Korea and China. Cho Young-wook’s score is simply excellent, setting the perfect mood required for a thrilling film as this. Much like Park was the NIS’s ace in the hole, the film’s ace is its casting. Hwang Jung-min is one of South Korea’s most bankable stars (two of the 5 highest grossing domestic films at the South Korean box office, “Ode to my Father” and “Veteran”, feature him) and one is almost certain that he is going to be excellent in anything that features him, and he does not disappoint here either. He effortlessly slips in the skin of the patriot, the bumbling businessman, the man split between duty and righteousness. Cho Jin-woong (“A Hard Day”, “The Handmaiden”) is understated, and might one say slightly underused, as Director Choi. After both the “Along with the Gods” films, and “Dark Figure of Crime” in the last couple years, this is another feather in Ju Ji-hoon’s cap, whose Chief Jong is as menacing as he is handsome. But Lee Sung-min wins all the praise as Ri Myeong-woon. Best known for his supporting roles, he really came into his own in 2018 with “What a Man Wants” and “The Witness”, but this is arguably his best work yet. 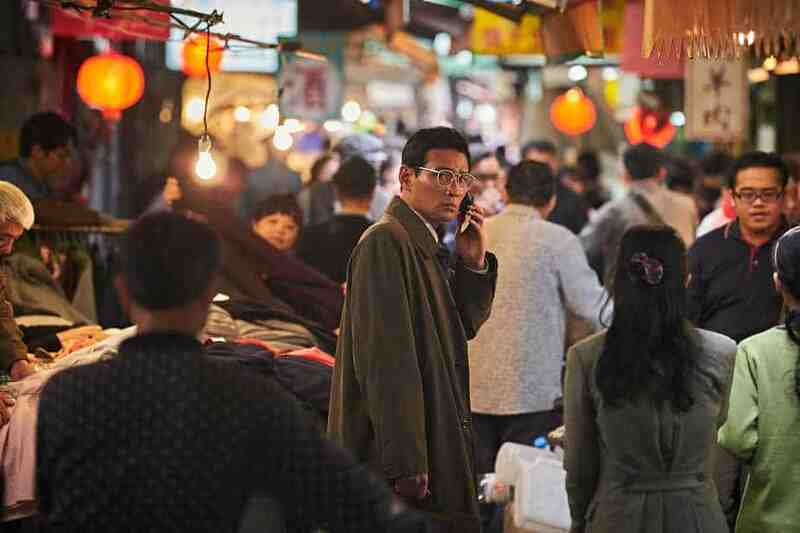 It is a tall order standing toe to toe with an actor of Hwang Jung-min’s calibre, but Lee is almost effortless and trumps in almost every scene he features. If there ever was a timely film in 2018, it was “The Spy Gone North”. Premiering Out of Competition at Cannes just a month after the historic meeting between the leaders of North Korea and South Korea to strengthen relations between the two countries (something that is often talked about in the film) and hitting cinemas three months after, it is a fitting tribute to the efforts of all the unsung, codenamed heroes, or indeed villains, that eventually led to this positive step in the relationship between the two countries.